This 40th birthday cakes flavor was red velvet with buttercream icing. All was decorated with our hand made marshmallow fondant. Gayle W. from Wake Forest, NC ordered this custom designed cake for her husbands 40th birthday. This 1970 car was crashing into a brick wall on I-40! We hear that he survived the crash and has his sights set on I-95. 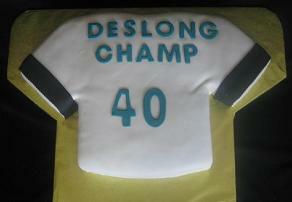 Colleen D. from Sanford, NC ordered this 40th birthday sports cake for her husband, Deslongchamp. 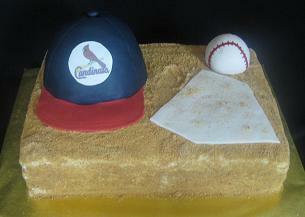 The baseball, home plate, and baseball cap were marshmallow fondant. The cake flavor was white with butter cream icing covered with graham cracker crumbs for the sand look. The Cardinals baseball team logo on the hat was printed on edible frosting paper. The 40th jersey cake was also made special for Deslongchamp. The jersey cake flavor was chocolate with buttercream filling and covered with our hand made marshmallow fondant. ”Hi Stephanie, the cakes were great, and everyone loved them! 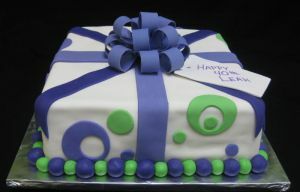 Thanks again!” Colleen D.
This cakes flavor was carrot with cream cheese icing covered with marshmallow fondant. 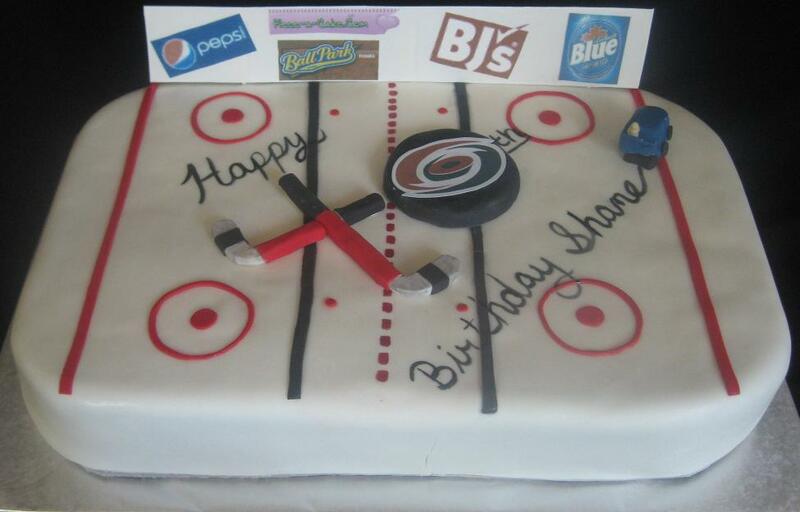 Michelle P. ordered this hockey cake for her husband Shane. 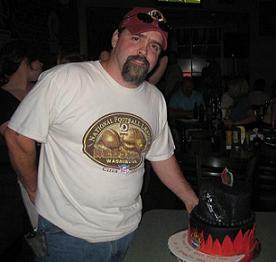 He was celebrating his 40th birthday on July 4th. 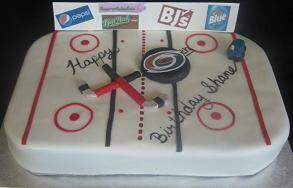 They are both huge Hurricanes fans “Caniacs” and wanted a cake that would reflect his passion. We started with a hockey rink with a raised hockey puck and hockey sticks to make the 40. Then made a small fondant zamboni to look like it did the writing on the ice! The billboards were also printed on edible frosting sheets. 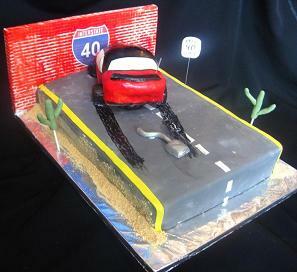 40th birthday cakes are sometimes referred to as “over the hill” cakes. These over the hill cakes are fun to make and the perfect cake idea can add to the excitement of the 40th birthday party. Kim U. of Raleigh ordered this 40th birthday cake. Kim has become one of my most returning customers and this time the cake was for her brother’s surprise 40th birthday party. His all time favorite singer is Bruce Springsteen, so Kim e-mailed me the picture from the album cover. 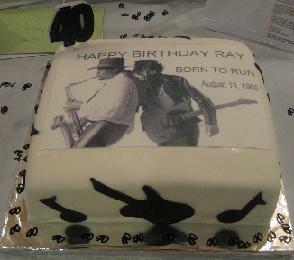 We played with it in print shop and came out with this one of a kind edible picture “Born To Run” to place on his cake. The picture cake flavor was marble with raspberry filling. 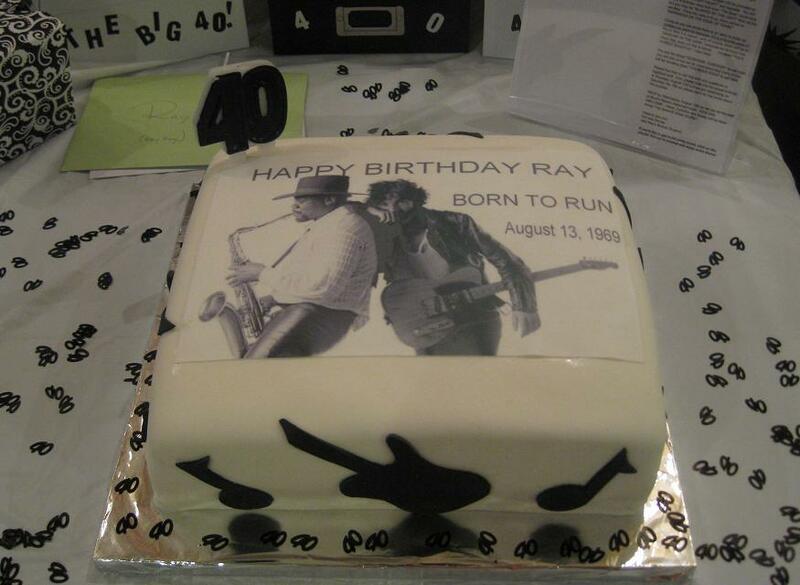 Hope you had a great birthday Ray and look forward to the next cake Kim! 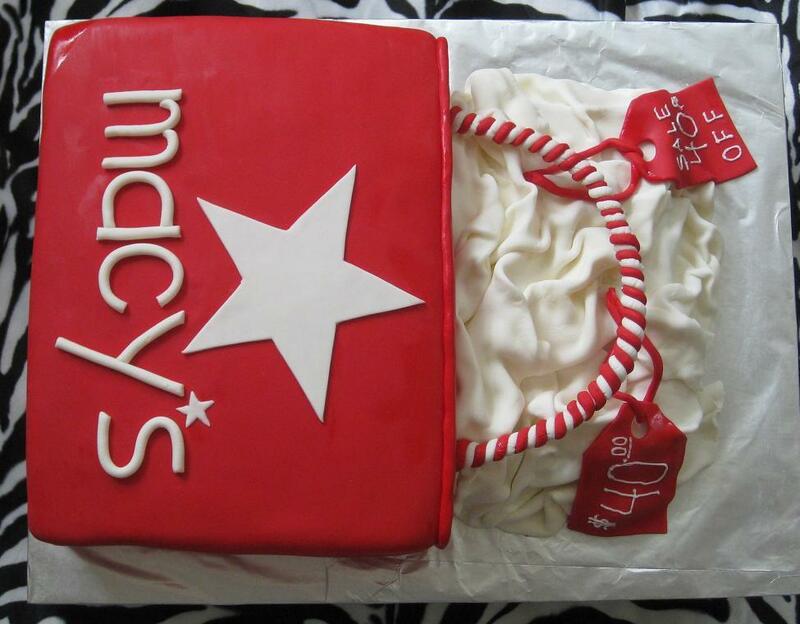 A loving husband and daughter teamed up on this Macy’s shopping bag cake to surprise Kristie S. on her 40th birthday. 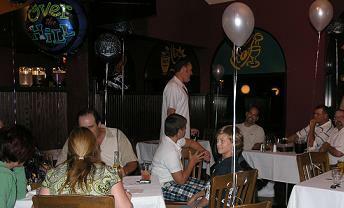 The party was at the Long Horn restaurant in Raleigh where we delivered the shopping bag cake. I had a craving to stop by the mall for some reason after we delivered, hmm? 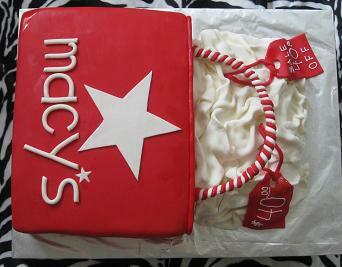 The cake was flavored white with buttercream icing then covered with our hand made marshmallow fondant colored red. Ask Steph about 40th birthday cakes. 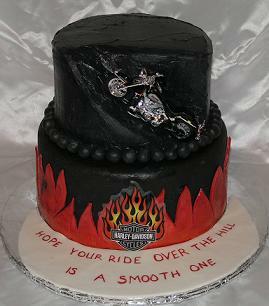 A loving wife Jenn, ordered this Harley Davidson birthday cake theme for her husband to celebrate his 40th birthday. He, of course, has a Harley and is a very successful custom hot rod painter at Comptons Custom Paint in Cary He is well known for his flames! 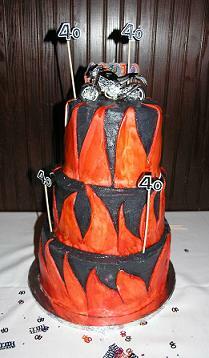 Combining the flames and the Harley as the cake topper along with some flaming 40 candles made for the perfect 40th birthday cake! The cake was three flavors; chocolate, yellow and French vanilla with butter-cream icing and covered with red painted fondant cut outs to make the flames. Our 40th birthday cakes are custom designed to match the cake with the theme of your party and personality of the person celebrating. 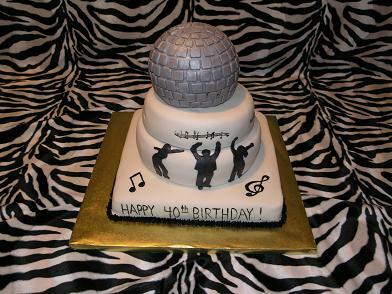 Chaz B. from Holly Springs, NC ordered this 40th birthday disco cake. 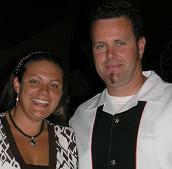 She was throwing her husband a surprise 40th birthday party and the theme was a disco 70’s party! The disco cake flavors were almond with strawberry filling and butter cream icing covered with marshmallow fondant and topped with an edible disco ball. ”Hey Steph, I want to say thank you for making such an awesome birthday beer cake. My boyfriend loved it. He was totally surprised! Holly O. ordered this 40th birthday beer cake special for boyfriend Paul. His two favorite things are beer and the band KISS. 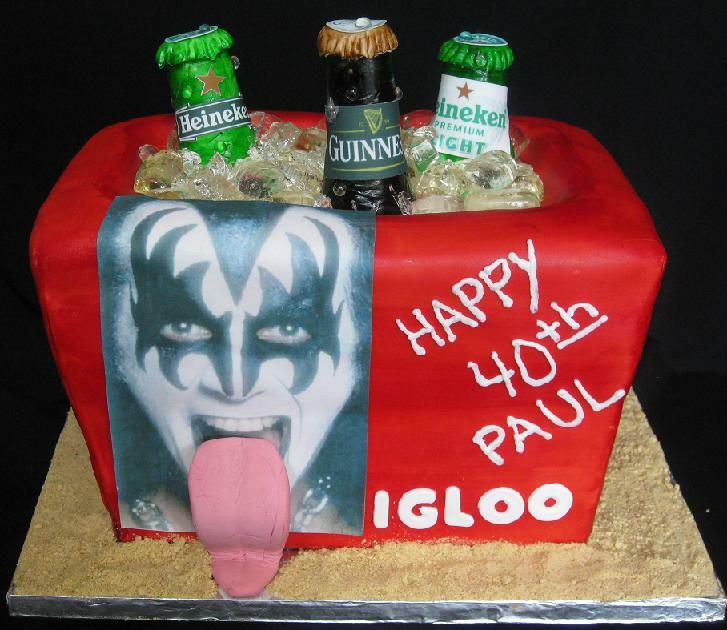 So how about an KISS ice chest full of his favorite beer? The cake flavor was marble with vanilla custard filling covered with chocolate frosting then covered with marshmallow fondant. The ice cubes were sugar and the labels were edible! See some of our beer birthday cakes here. 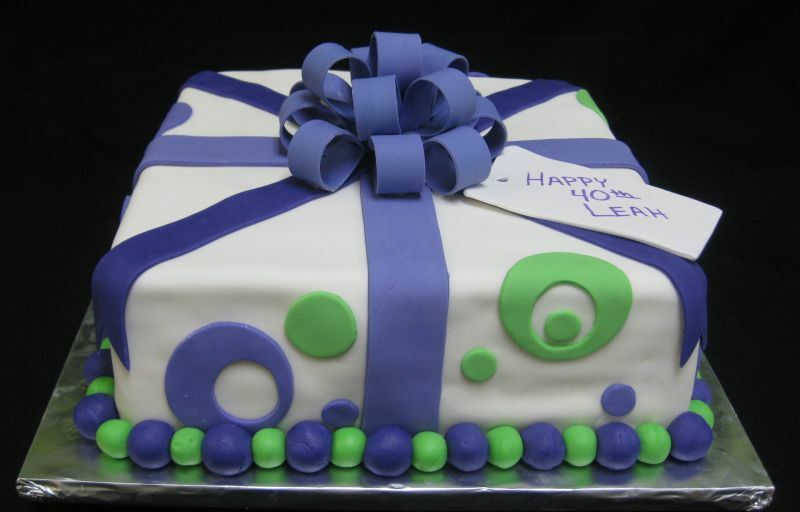 This 40th birthday cake was ordered for Leah by her loving husband Eric as a special present cake for her birthday. The flavor was French vanilla with butter cream and decorated with our yummy hand made marshmallow fondant.